Despite a problem with a reaction wheel, Dawn continues to spiral outward from the asteroid Vesta, where it has spent the past year. 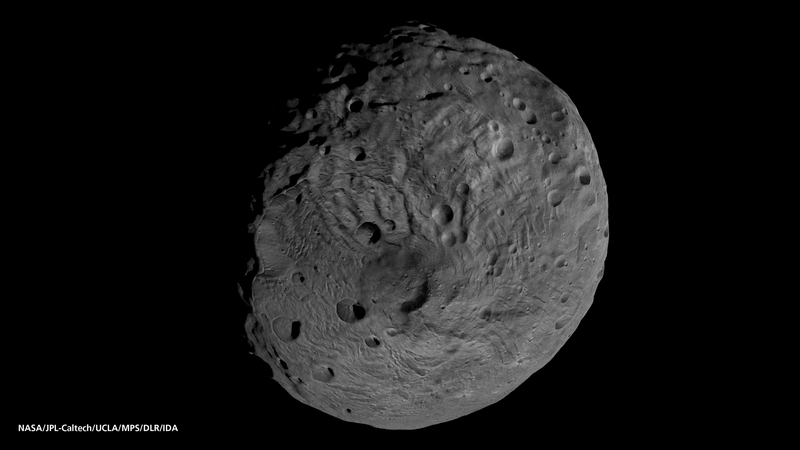 Today, 26 August, Dawn is formally scheduled to depart Vesta. Both the internal and external structures have been thoroughly mapped. The Dawn mission to Vesta has been so smooth and uneventful that the entire 40 day reserve at Vesta has been allocated to additional low level and high level scientific observations. The low level (average altitude 130 miles or 210 kilometers) imaging, gamma ray and neutron detector observations, and gravity data gathering will continue until 1 May 2012. After that, Dawn will spiral upward to a high altitude orbit for additional mapping. in July of 2011, much of the Northern Hemisphere was in shadow. Now, some of that region is in sunshine, and Dawn can gather details from there. 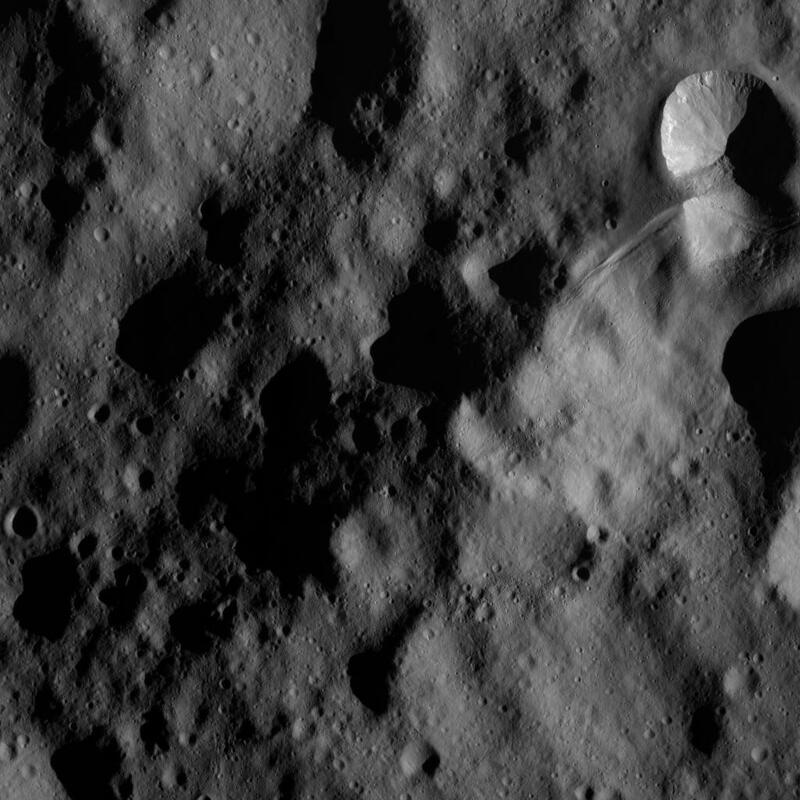 Dawn is now scheduled to depart for Ceres on 26 August, arriving as planned in February of 2015. 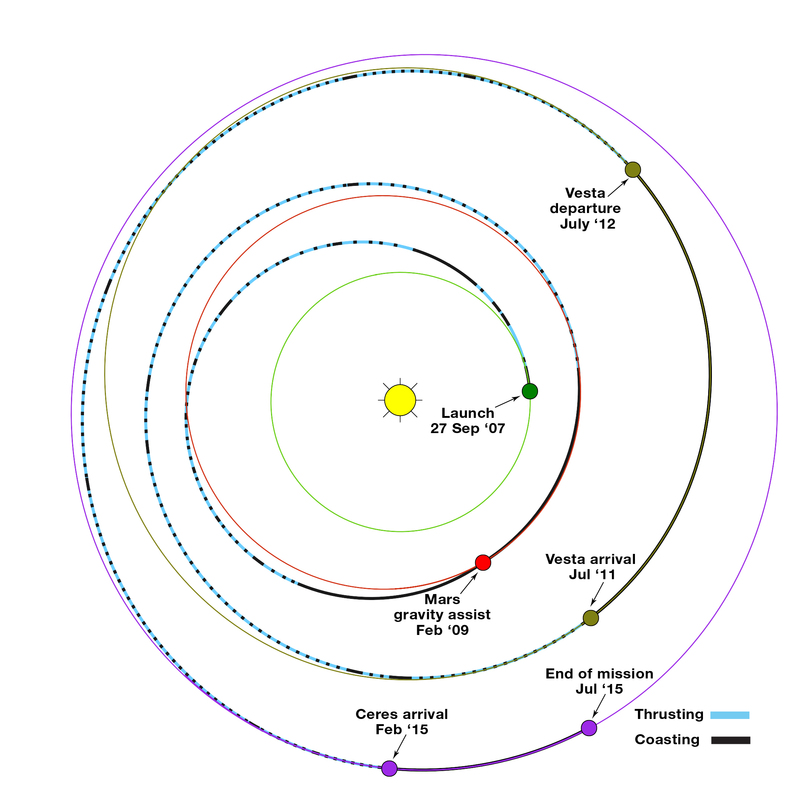 The Dawn spacecraft is beginning to wrap up its mission surveying Vesta. It completed the 70 day Low Altitude Mapping Orbit (LAMO) portion of its mission in December, January and February. The mission has been so smooth that the 40 days of reserve observation time have not been used. They will now be applied to the low altitude study of the composition of the surface and mapping of the gravity field. Dawn is currently about 210 kilometers above the surface. We will discuss some of these low altitude images here. For a full description of the Dawn mission, see here (pdf). See also the nssphoenix articles on the mission, orbital capture, the rotation of Vesta, and previous low altitude images. In January, scientists at NASA’s Goddard Space Flight Center in Greenbelt, Maryland, completed models of the average global temperatures on the asteroid Vesta, and concluded that it is cold enough that ice could exist below the surface of the poles (see the article in the January 2012 issue of the journal Icarus). Vesta is the second largest asteroid (after Ceres) in the belt between Mars and Jupiter. However, because of the axial tilt (27 degrees compared to Earth at 23 degrees), there are likely to be no locations where ice would remain frozen on the surface. This includes the 480 kilometer wide crater at the south pole (image above). Below, left is Severina crater, a relatively young crater with sharp edges. It is approximately 25 kilometers in diameter located inc Vesta’s Rheasilvia quadrangle (see map at bottom), near Vesta’s south pole. On the rim is a newer small crater with sharp features. Below, right is an older crater, degraded along the rim from bombardment from space. 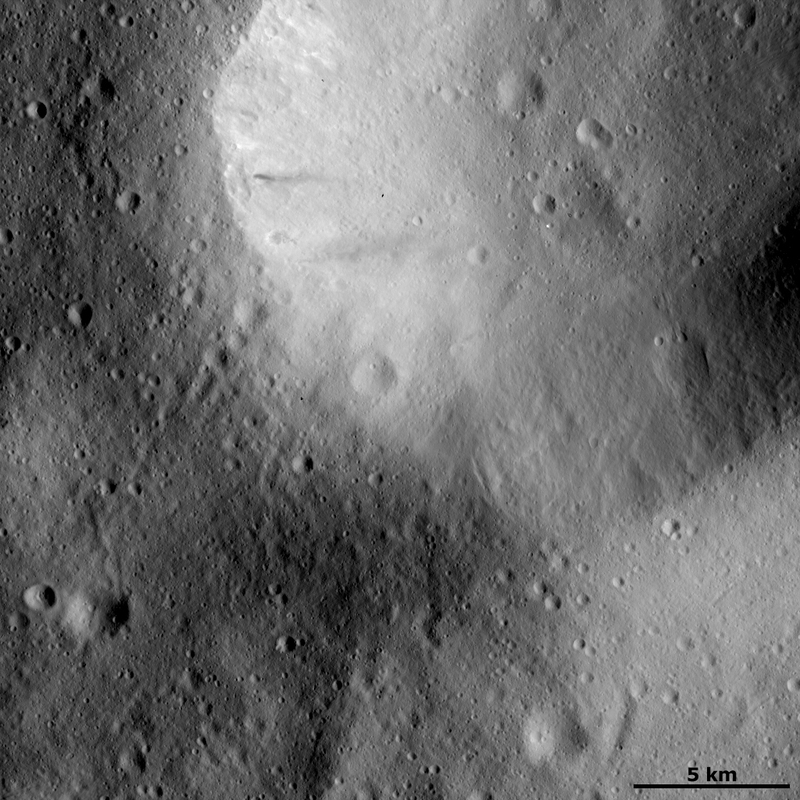 Many smaller young fresh craters pockmark the area, both inside and outside the old crater. The image was taken from an altitude of 272 kilometers, and is located in Vesta’s Oppia quadrangle. 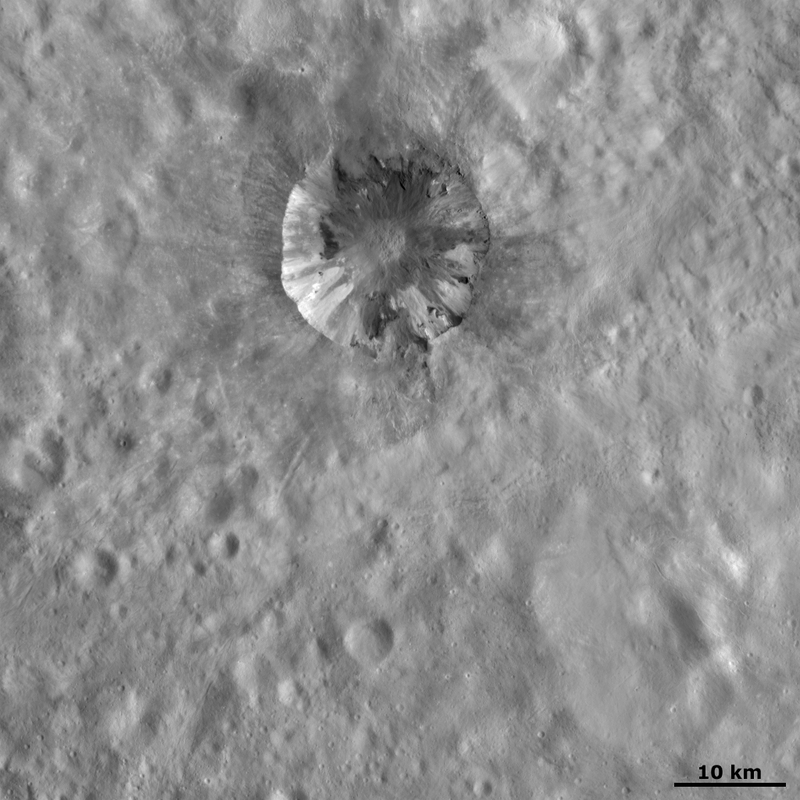 Below, left is Cornelia crater. Cornelia is a very young crater, about 15 kilometers in diameter, and located in Vesta’s Numisia quadrangle. The rim has partially collapsed, and the smooth surrounding area indicates that a large amount of fine-grained material was ejected during formation. The slumping material inside the crater is consistent with the fine-grained material in the ejecta. 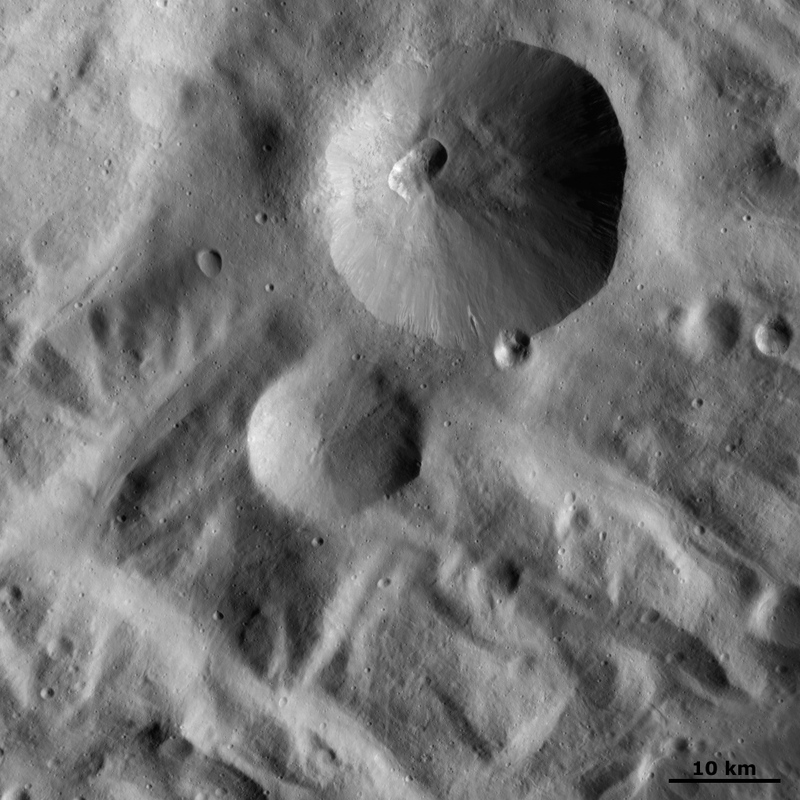 Below, right, is a high resolution image of the surface in Vesta’s Oppia quadrangle, taken from an altitude of about 190 kilometers. Resolution is about 17.5 meters per pixel. The image is saturated with large and small craters, accumulated over billions of years. 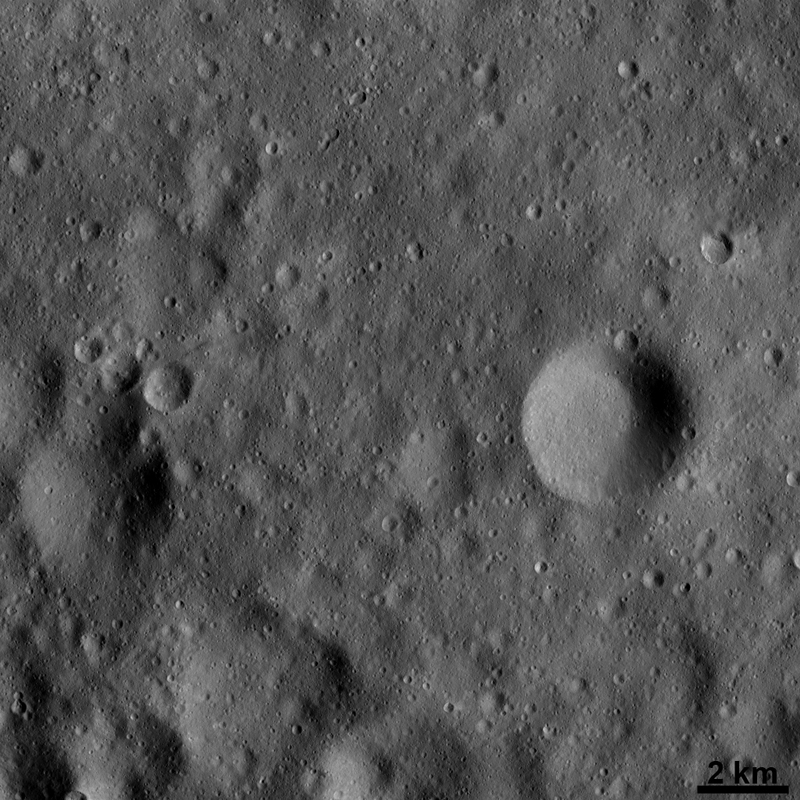 Sharp edged craters are young, and blurred, smoothed craters are old. Young craters are on top. 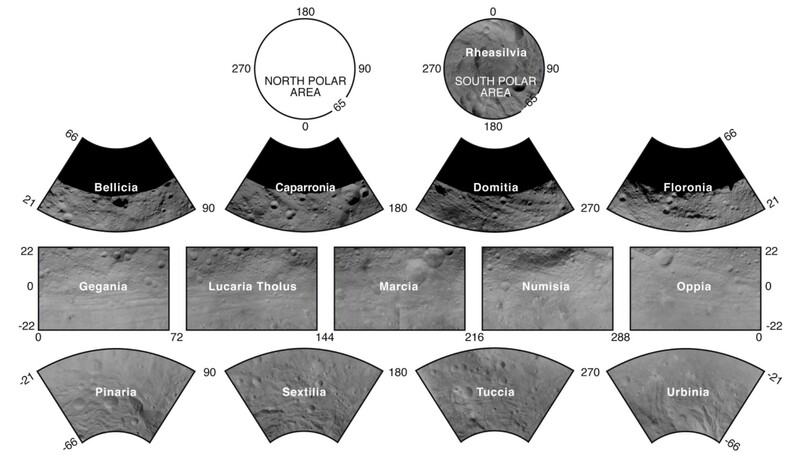 Above is a quadrangle map of Vesta, showing the locations of quadrangles referred to in the article here. Additional maps can be found here. The spacecraft Dawn has successfully reached its low orbit of 230 kilometers above the asteroid Vesta, for intense scientific research. The primary instruments at this level will be the gamma ray and neutron detector (GRaND) and the gravity experiment. Currently, scientists expect Dawn to spend ten (10) weeks at this altitude. The objective is to determine the kinds of material (atoms) on the surface of Vesta and measure the gravitational field of the asteroid. 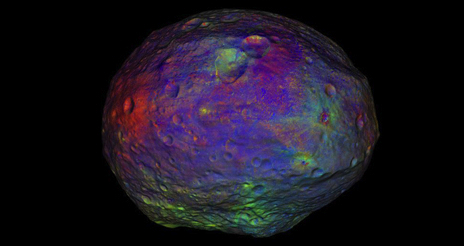 Scientists want to determine the distribution of masses within Vesta. Dawn has performed some complicated and beautiful choreography in order to reach this lowest orbit.” We are in an excellent position to learn much more about the secrets of Vesta’s surface and interior. After this data collection period, Dawn will spiral outward to a new orbit around 680 kilometers above the surface for another high altitude mapping campaign. The Sun will then be higher in the northern regions of Vesta fir better imaging. Dawn plans to leave Vesta in July 2012 and arrive at its second destination, the dwarf planet named Ceres, in February 2015. Image Credit: NASA The Dawn mission seeks to answer questions about the origins of planets in the Solar System. What are the roles that the size of a body and the amount of water held by the body play in the evolution of bodies in the Solar System? 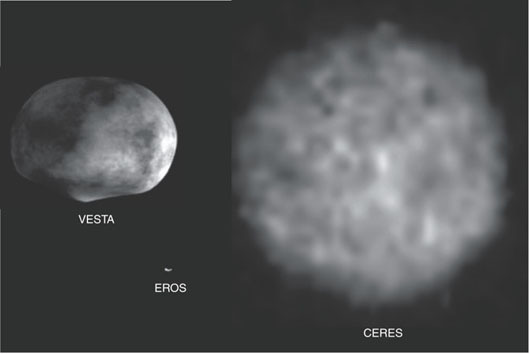 Vesta and Ceres are two bodies that contain clues to these questions. These baby planets were interrupted by the formation of Jupiter, which scooped up a lot of material that might have been accreted by these two bodies. 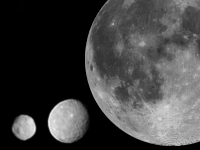 Vesta turned out evolved and dry, while Ceres turned out wet and primitive. Ceres and Pluto are the two dwarf planets that have been observed in enough detail to qualify them as dwarf planets based on their having enough mass to be rounded by their own gravity, but have not cleared their neighbouring region of planetesimals and are not a satellite. Vesta, on the other hand, is classified as a Small Solar System Body. These objects do not posses enough mass to be rounded. They are not in hydrostatic equilibrium. Dawn’s mission is to visit these bodies and see what makes them tick. What are their current properties, where did they form, of what are they composed. It has been suggested by many that Ceres, with its supply of water, might well become the “gas station” of the Solar System economy. Water can be broken down into Hydrogen and Oxygen. Hydrogen and Oxygen can be burned as fuel and oxidizer to propel spacecraft. Hydrogen can be used with carbon sources to produce methane and other hydrocarbons, useful as chemical feedstock for plastics and other products. Image Credit: NASA One of the strong points of Dawn is that it makes use of components proven on other successful spacecraft. These include: the ion propulsion system, based on the design validated on Deep Space 1, Flight proven attitude control system used on Orbview, TOPEX/Poseidon ocean topography mission, and Far Ultraviolet Spectroscopic Explorer, Simple hydrazine reaction control subsystem with two sets of six 0.9 N engines used on the Indostar spacecraft, Command and data handling uses off the shelf components and Modular flight software based on design used on Orbview. Once Dawn was launched by the 76th consecutive successful launch of a Delta II (read this interesting blog post on the event), the spacecraft began using its ion propulsion to get the additional velocity needed to reach Vesta. Dawn’s engines have a specific impulse of 3100 s and a thrust of 90mN. While a chemical rocket on a spacecraft might have a thrust of up to 500 Newtons, Dawn’s much smaller engine achieves an equivalent trajectory change by firing over a much longer period of time. 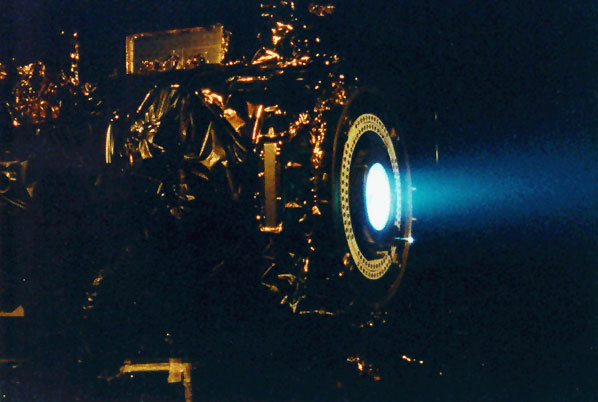 Dawn will then use the ion engine to lower its altitude to Vesta, where it will begin its exploration (pdf). 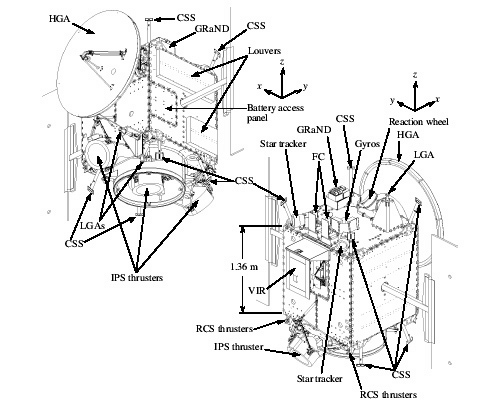 The science payload consists of two cameras, a visible and infrared mapping spectrometer to reveal the surface minerals, and a gamma ray and neutron spectrometer to determine the elements that make up the outer parts of the asteroids. The spacecraft also will be used to measure the gravity field, thereby revealing details of these asteroids’ interiors. 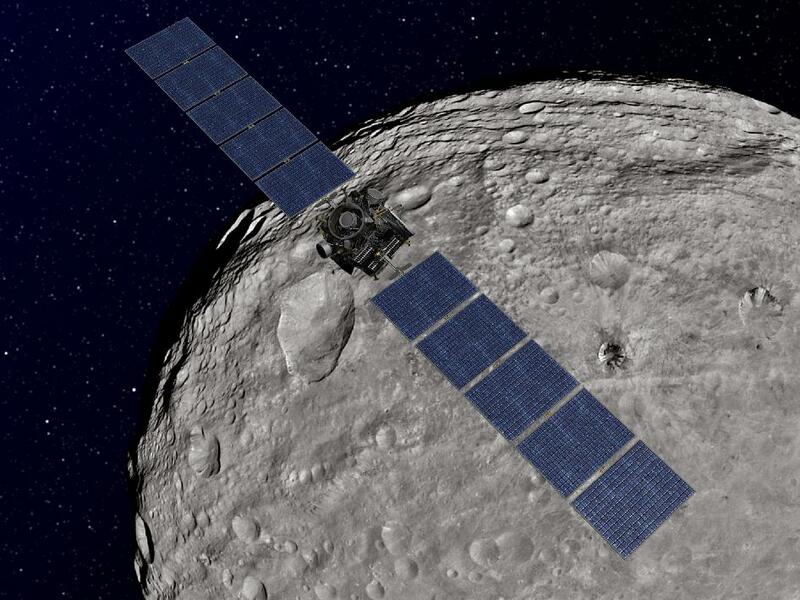 Image Credit: NASA Dawn will use the ion engine to leave Vesta and cruise to Ceres. It will spiral to a low altitude orbit at Ceres. Ion propulsion makes efficient use of the onboard fuel by accelerating it to a velocity ten times that of chemical rockets. A great list of Frequently Asked Questions (FAQ) about the mission can be found here. The current status of the mission can be viewed here. Click on the images to see a larger view—images are updated hourly. Currently, Dawn is a year away from Vesta. Pluto, now contentiously classified as a dwarf planet, is member of a class of Kuiper Belt objects that include Eris (the largest – Pluto is second), Ceres, Haumea, and Makemake. The trouble began in the late 1970’s with the discovery of Chiron, one of the minor planets, a designation made obsolete in 2006 and now referred to as small solar system bodies. There are approximately 200,000 of these objects. They are not sufficiently massive to squeeze themselves into a spherical shape, which is one of the rules for being classified as a dwarf planet (you have to be round). 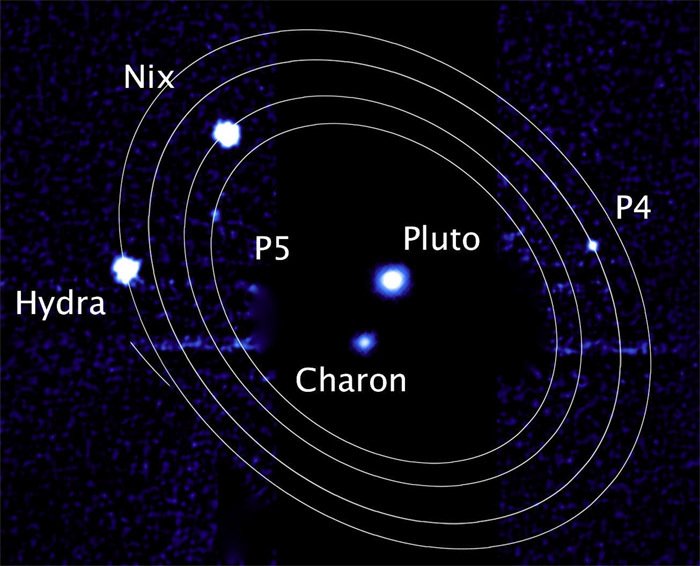 Pluto has been studied extensively by telescope, but no spacecraft has flown by the planet. The New Horizons spacecraft was launched on a fast track (36,370 miles per hour) toward Pluto on 19 January 2006, using an Atlas V 551 first stage, a Centaur second stage and a STAR 48B solid rocket third stage. 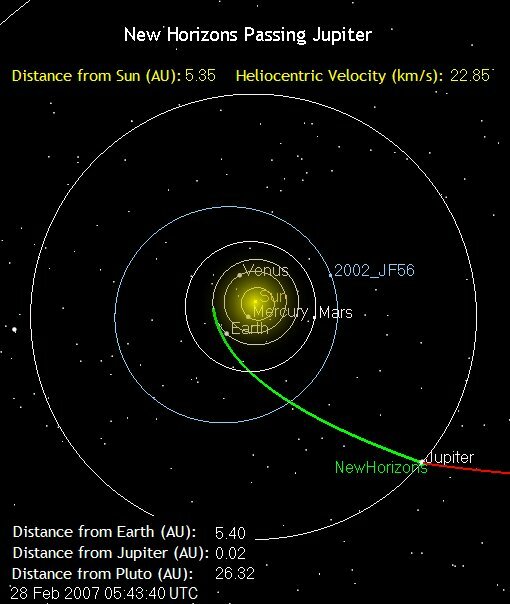 Flying at 51,000 miles per hour (about 23 kilometers per second – kps) during a gravity assist from Jupiter on 28 February 2007, New Horizons is expected to arrive at Pluto on 14 July 2015. During its flyby of Pluto and Charon, New Horizons will be traveling at 31,300 miles per hour (14 kps). New Horizons was designed, built and is operated by the Johns Hopkins University Applied Physics Laboratory (APL) for NASA, and the Jet Propulsion Laboratory (JPL), along with other research organizations. Why go to Pluto? 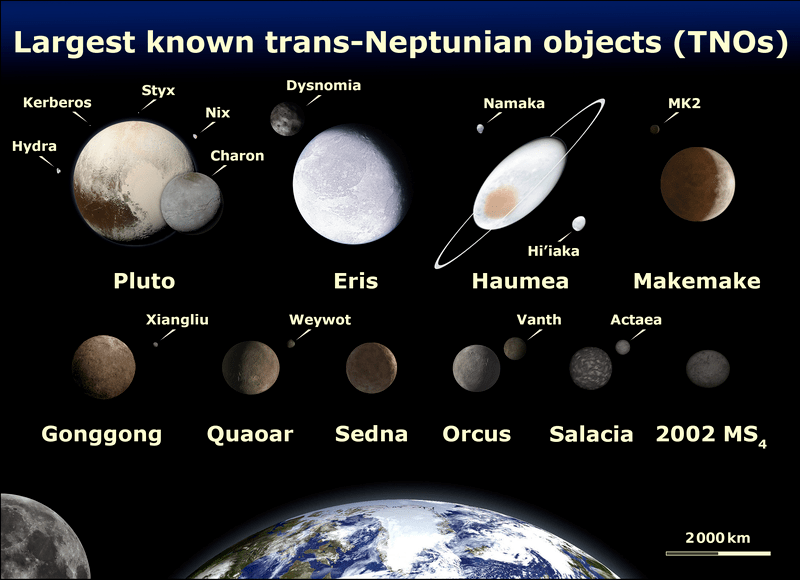 Our solar system is composed of three groups of planets: the rocky worlds (Earth, Venus, Mercury and Mars); the gas giants (Jupiter, Saturn, Uranus and Neptune); and the ice dwarfs of the Kuiper Belt (Pluto, Eris, Makemake, Haumea, and Ceres along with 35 or more additional dwarf planets). Indeed there are many more ice dwarfs than major planets in the Solar System. The ice dwarfs are planetary embryos, whose growth stopped at sizes (200 to 2,000 kilometers across) much smaller than the full-grown planets in the inner solar system and the gas giants region. The ice dwarfs are ancient relics that formed over 4 billion years ago. Because they are literally the bodies out of which the larger planets accumulated, the ice dwarfs have a great deal to teach us about planetary formation.